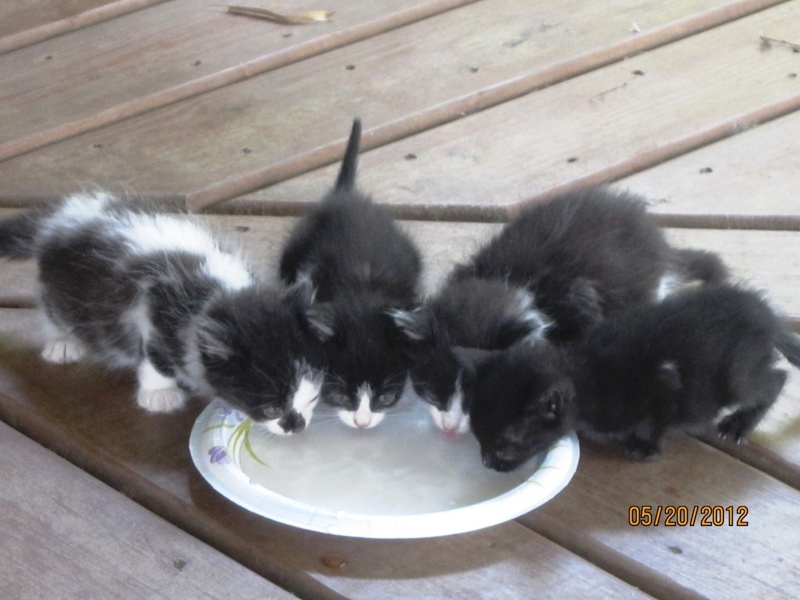 While I continue to read and write, I will leave you with a family portrait of Pickles, Hillary, and their other two siblings before I rescued them. Sadly I only caught Mr. P and Sir Edmund. The other two eventually disappeared. Pickles is one the left, Hillary is second from the right. What exceptional coloring variations! They look very cute (for cats). I’ll admit, I have a problem with small animals. I don’t know if you know dog history, but, “Terrier” means, “of the Earth” and we, all Terriers, have always been working dogs, used to ferret out smaller creatures (the smaller the Terrier, the smaller the creature hunted) – from the Earth; rats, rabbits, foxes, and the like. Thus I believe I have a historical reason for not being patient with the smaller animals. However, I will maintain, at the risk of losing my dog dignity, they they are very cute kittens. My cats are very affectionate. My boy cats are more demonstrative than my female cat, but my boys are just babies and the female is old. Even so Maggie, you sound like you are an earthquake of face licking love.